fraras-4-Aminocyclohexanol has been used to prepare the paromamine analog 93 (compounds 93-99) and the neamine derivatives 94, 95, and 96. In these syntheses the corresponding 2'-amino-a-glycosides were prepared by the method of Lemieux using the dimeric 2-nitroso a-d-hexopyranosyl chlorides 97 and 98 with appropriately protected cyclohexanols to afford 2-oximino a-d-hexopyranosides (e.g., 99) . Reductive deprotection in aqueous hydrazine gave the title compounds 93, 94, 95, and 96. However, none of these analogs exhibited minimum inhibitory concentration (MIC) values of less than 200 mg/mL. In another report, paromamine 92 was converted to the pseudodisaccharide 100, which is a constituent of the structure of oxyapramycin 101 (compounds 100, 101). Two-carbon chain elongation was performed by Wittig reaction on a 5'-aldehyde derivative followed by osmium tetraoxide hydroxylation, which after lactonization in the basic condition, followed by reduction and deprotection, afforded compound 100 . Paromamine and its 3'-deoxy analog (lividamine) have been converted to the corresponding ethenic 6'-aldehyde derivatives 102 and 103, respectively. 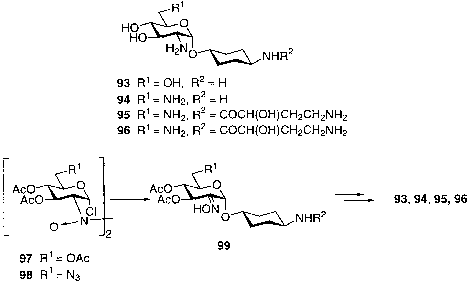 Reductive amination of the aldehydes followed by deprotection yielded the pseudodisaccharides 104, 105, 106, and 107, which showed less in vitro activity than the parent neamine  (compounds 102-107 ). 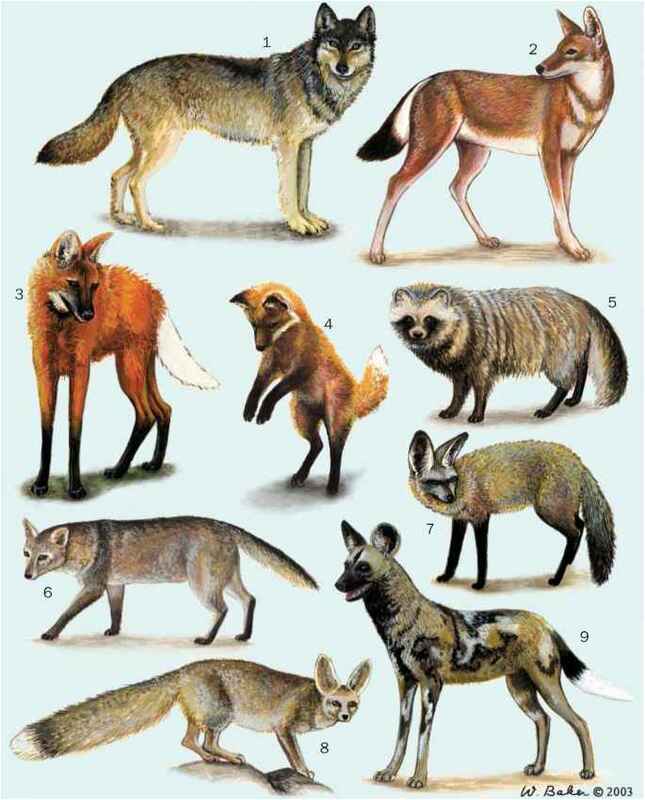 were performed in the presence of mercuric cyanide. Antimicrobial activity results revealed that compound 108 was as active as apramycin against most gram-positive and gram-negative bacteria, and more active than apramycin against strains producing aminoglycoside-modifying enzymes. However, 109 was less active than 108  (compounds 108, 109). Selective acylation of amino groups of apramycin and related aminoglycosides has been achieved in the presence of metal acetates , and paromamine has been used to synthesize the 4-0-(aminooctodiosyl)-2-deoxystreptamine (compound 110), a close analog of the pseudodisaccharide present in oxyapramycin [61,65]. was prepared from a suitably protected neamine analog by sequential periodate oxidation and base-catalyzed ^-elimination. 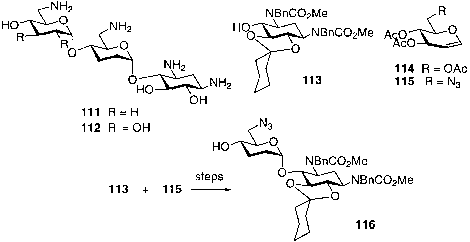 Coupling of 113 with 115 in the presence of BF3 followed by catalytic hydrogenation afforded the precursor 116, which was employed for glycosylation with 115 to make the apramycin analog 111 (compounds 111-116 ). A series of N-acyl derivatives of apramycin, including y-amino-a-hydroxybu-tyryl (AHB) and glycyl analogs have been prepared by Allen et al. , who used different transition metal ions, including Ni2+, Cu2+, and Zn2+, for regioselective acylation of the amino groups. 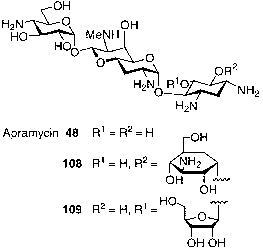 These investigators demonstrated that acylation of the amino group of apramycin at position 2' yields analogs with enhanced uptake, which can effectively penetrate the cell wall and kill bacteria. 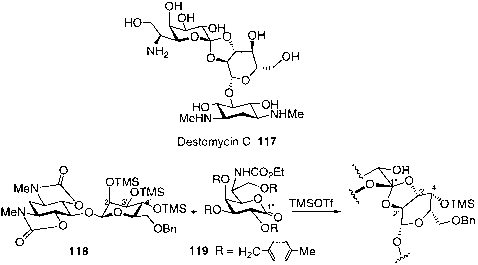 Yoshimura and colleagues [69,70] effected a total synthesis of destomycin C 117. 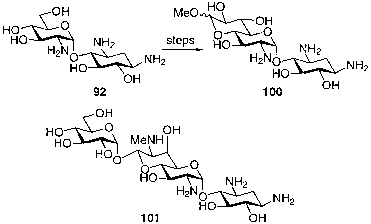 These workers used the pseudodisaccharide 118, which resulted from mannose and deoxystreptamine, for coupling with the destomic acid 119 (6-amino-6-deoxy-l-gly-cero-d-galacto-heptonic acid) to construct the orthoester linkage present at position 1" of the molecule. Inversion of the configuration at the 4'-position was performed by sequential oxidation-reduction of the 4'-hydroxyl group in the desilylated derivative in two steps, which after removal of the protecting groups led to the formation of the antibiotic (compounds 117^19 ). A total synthesis of neomycin B (34) from condensation of neobiosamine and neamine derivatives has been described .